Disabled Veterans Face A Faceless Bureaucracy The number of outstanding claims at the Department of Veterans Affairs for service-related disabilities -- amputations, injured limbs, PTSD, brain trauma -- hovers around 500,000. And more are coming into the system every day. As a result, critics say, there's a widespread perception that the VA stands against veterans rather than for them. Second of a five-part series. 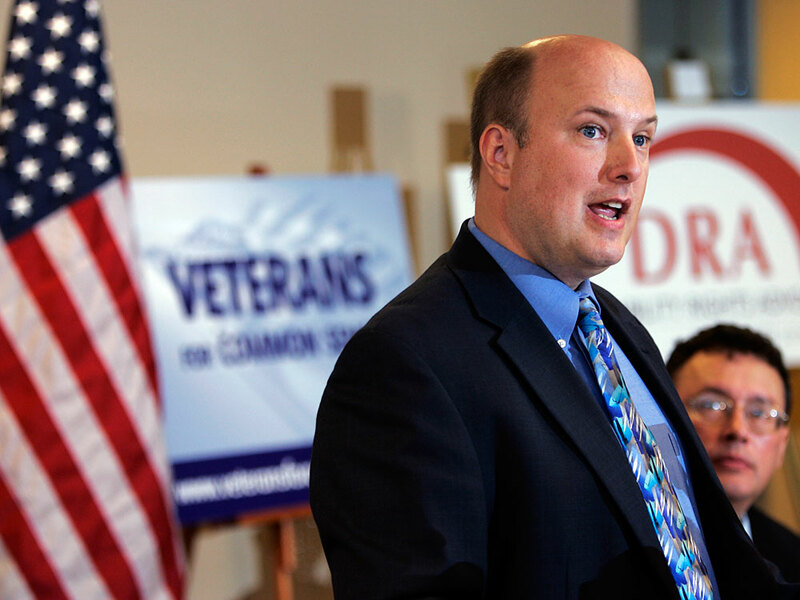 Paul Sullivan, executive director of Veterans for Common Sense, pictured here in 2007, has been fighting the Department of Veterans Affairs for years for having an unmanageable backlog of disability claims. He says the department's problems are only beginning. The Department of Veterans Affairs is struggling to cope with tens of thousands of veterans filing for disability benefits. Because there are applicants from two current wars -- plus a new wave from the first Gulf War and Vietnam -- thousands are now stuck in the clogged pipeline. Although the department and its critics differ on exact numbers, everyone agrees that way too many vets are waiting way too long to get benefits. Veterans Affairs Secretary Eric Shinseki is experimenting with ways to get the old, crippled bureaucracy to do better. The number of outstanding claims at the VA for service-related disabilities -- amputations, injured limbs, PTSD, brain trauma -- hovers around 500,000. Nearly 40 percent of those have been waiting on a decision for more than four months. And to make matters worse, another 100,000 claims are waiting for a decision at the Board of Veterans Appeals. The department has responded by hiring thousands of new claims adjudicators, a kind of brute force approach. War Veterans In The U.S. But Paul Sullivan of Veterans for Common Sense says that won't solve the problem. "The Department of Veterans Affairs is so complicated, it would drive a normal person insane in 3 minutes," Sullivan says. Sullivan has been battling the VA for years over the backlog issue. For six years, he worked inside the VA. Complexity, he says, is the department's backbreaking burden, beginning with a veteran's first perplexing hurdle: a 23-page application form. "The Department of Veterans Affairs takes three years to train a new employee on how to read that 23-page claim form," he says. Because of the intense training, those new hires won't be online for some time. And Sullivan says the department's problems are only beginning -- he says 440,000 Iraq and Afghanistan veterans have filed disability claims. "We expect that number to go up to about a million in the next four or five years," he says. "And more tidal waves are right behind it." Those tidal waves will be rolled in by Secretary Shinseki's new rules allowing claims from Agent Orange exposure in Vietnam and chemical exposure in the first Gulf War. The VA acknowledges that at least 200,000 new applicants will slow down claims processing even more in the future. Vietnam veteran John Wood knows something about how long it can take to get benefits. He served in the Army from 1969 to 1972. In Vietnam, he was a cavalry reconnaissance scout near the border with North Vietnam, where he saw several of his fellow soldiers cut down in combat. "It took me from 1972 to 2006 for the VA to admit that I had post-traumatic stress disorder," he says. "They were saying that I couldn't prove that I had any combat status in Vietnam, and so it couldn't possibly be post-traumatic stress disorder because I wasn't in combat, which I was." The VA insisted that because he had been trained as a clerk, he would not have been sent into combat. But Wood was reassigned when he got to Vietnam. The burden was on Wood to prove that he had been in combat. He solicited testimonial letters from fellow soldiers and dug up after-action reports from Army records to make his case. Thirty-four years later, the VA Board of Appeals acknowledged that he had been in the shooting war and granted his claim. Another veteran who faced a hard process was Tia Christopher, who was raped in her barracks while she was attending language school to learn Arabic. When she got out of the Navy, she went to a VA hospital for psychological help. Staff at the hospital advised her against filing for disability benefits. "Even though we got really good health care, they told us it would be really traumatic, a re-traumatizing process to file a claim, and that you basically have to kind of defend yourself. You would basically be put on trial to do this claim. That idea scared the hell out of me," Christopher says. But it didn't scare her enough to keep her from filing a claim, which was denied. Then, with the help of the veterans service organization Swords to Plowshares, she filed an appeal. Eight years later, she won. For both of these vets, the VA remained a faceless bureaucracy throughout their ordeal. Critics say it's not surprising that the VA's medical branch advised Christopher against filing a claim with the benefits branch because it would be too traumatic. There is a widespread perception that the VA stands against vets rather than for them, they say. And that's something Secretary Shinseki has set out to change. "When the new secretary came in, one of the first things that he said to us was a recognition of the fact that many veterans do perceive us that way," says Michael Walcoff, the VA's undersecretary for benefits, "and that we need to do whatever we can do to make sure that our people understand that their role is to be an advocate for the veteran, not an adversary." It's a tall order to turn around a huge bureaucracy encumbered by a culture and rules developed over the decades since World War II. But the VA has launched a number of pilot programs to streamline and simplify the application process. One program is in the VA regional office in downtown Pittsburgh. Downstairs in the service center, row after row of white file cabinets stretch across the room, and piled on top are thick bundles of files so big they can't be put away. Paper rules at the VA; electronic files are years away as the VA builds a new system. All of this paper now lumbers back and forth between the veteran and the VA via snail mail, while veterans almost never have any face-to-face -- or even telephone -- contact with people handling their claims. Beth McCoy, the regional office director, says the staff of the pilot program, known as Team Delta, aims to change that by actually making personal calls to veterans. "We're surprising them," McCoy says. " 'Is this really the VA calling? No one from VA has ever called me before.' It's a positive experience for the veterans, and it's really a positive experience for our employees. 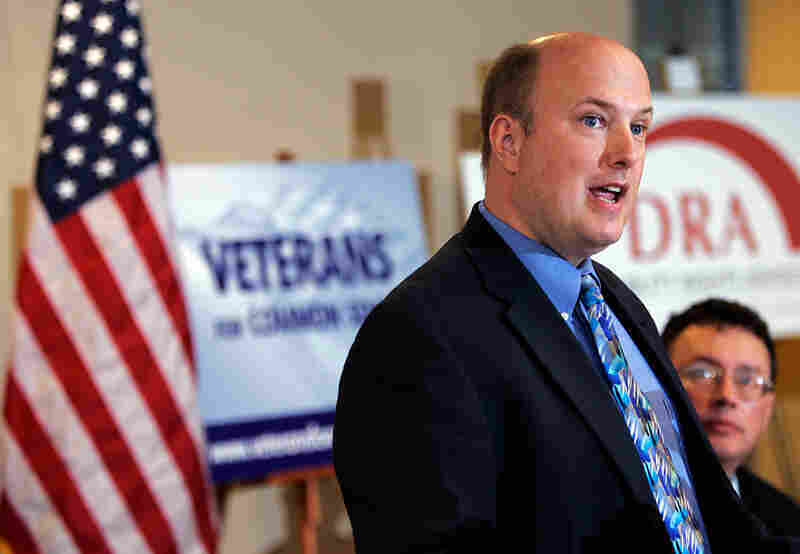 Rather than working with paper files, they're working more directly with veterans." And there are almost unheard-of face to face contacts with veterans -- contacts which, the team has discovered, can be wrenchingly emotional. Vietnam veteran Arthur Rhone says his experience with Team Delta is the best he's had with the VA.
We're surprising them. 'Is this really the VA calling? No one from VA has ever called me before.' It's a positive experience for the veterans, and it's really a positive experience for our employees. "They all introduced themselves to me, they're all nice people and they seem like they're concerned for me," he says. "They not here for a paycheck; they here for me." Rhone starts his session about a PTSD claim with a tense recitation of the horrors he witnessed in Vietnam, and he ends with a story about the time a mother and daughter were stopped at an American checkpoint. The mother was a Viet Cong suspect carrying a large sum of money. Rhone's squad leader told him to use the daughter to pressure the mother to confess that she had more money hidden away. "So they told me ... it was during the rainy season ... get the girl, jump down in the rice paddy. I'm up to here, I grabbed the girl, she's about 8 years old, and I ducked her down in the rice paddy till the mama-san told where the money was. I almost drowned her. I live with that every day of my life, OK? It's with me all the time. I wish you could take your hands and scrub it out my damn brain. You think you can do that for me? Y'all think you can help me do that?" Rhone jams his chest with his thumb for emphasis. People in the office calm him, but when he sits to sign a document, his hand is shaking so badly he has to steady it with his other hand. Even though we got really good health care, they told us it would be really traumatic, a re-traumatizing process to file a claim, and that you basically have to kind of defend yourself. You would basically be put on trial to do this claim. That idea scared the hell out of me. "I appreciate that, you guys. Thank you," he says. But Team Delta has only eight people in a bureaucracy of nearly 20,000. The jury is still out on whether its personalized approach is feasible for the entire Veterans Benefits Administration.